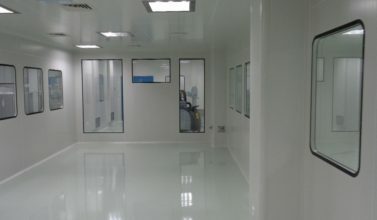 In previous posts, we have offered our tips on selecting the right containment solution for your needs, best practices for validation of containment systems and material transfer devices used to transfer highly potent and toxic materials from one containment system to another. For the next post in this series, let’s talk about access devices that are used to manipulate processes, products or tools inside containment systems. It is imperative to correctly select appropriate access devices or combination thereof as these are crucial to the successful operation of containment systems. 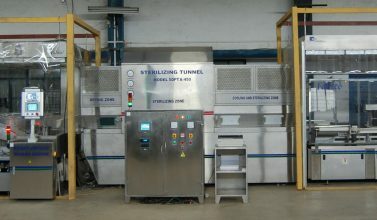 Manipulation is achieved by manual operation or robotic handling. Common choices available for operator manual manipulation devices include gauntlets, glove system, half suits or similar devices that allow extended reach and remote manipulation. Where possible consideration must be given to alternate manipulation devices that minimise the number of openings through the containment system. Robotic handling consists of automated systems designed to manipulate materials in a containment system following a prefixed process sequence for specific applications. This post will focus on gloves and half suits as they tend to be the weakest link in the pressure integrity of a containment system. Operator, environment and product protection is limited by choice of material used for the glove or half suit system. Glove system comprises of a glove, glove port and fastening mechanisms to secure gloves over the glove port. Gloves form a non-metallic flexible barrier between the operator’s hand and the potent materials being handled inside the containment system. Glove systems are available as single piece gloves or glove sleeve cuff arrangements. Material for the gloves are carefully selected for the containment application and require delicate handling. The gloves are available commercially in standard dimensions. The length of the glove depends on the depth of the containment system. Lengths available include 700, 750 and 800 mm. Glove shapes are ambidextrous, left hand and right hand. Fabtech’s containment systems offer ambidextrous gloves as standard execution. The thickness of glove selected should be a function of tactile requirements, permeability, chemical resistance, mechanical strength, wear resistance and ease of manipulation. Single piece gloves are attached to the glove port mechanically using an O ring. Another option which provides a bit of flexibility is the glove-sleeve cuff arrangement. These cuffs are elasticized to provide a good and secure grip. The sleeves are attached to the glove ports and securely fastened by the action of O ring. Opposite ends of the sleeve are fitted with an interchangeable glove cuff ring. At Fabtech, we have standardised the circular glove port to 2 sizes for ease of fit, interchangeability of components and easy access to the area within the containment system. This standardisation ensures a hassle-free integration with either a manual or automatic glove leak tester new containment system or retro fitment and addresses inventory concerns. The choice of materials depends on the application – variations include Teflon, Derlin, and different polymers SS 316 L. Glove ports are mechanically secured with the containment system and made airtight manner. Gloves are fitted to the glove port in a leak-proof manner. Fabtech offers customised designs for specific requirements. Glove ports are designed to facilitate the safe change of gloves without any breach in the integrity of the containment system as standard execution. The glove or sleeve is secured to the glove port by an O ring or a combination of O rings. O rings are easy to manipulate and simplify safe switching of gloves. O rings form a high integrity joint and are designed to handle 1000 Pa leak test pressure. A half suit consists of either a single layer (negative pressure containment system) or double layer (positive pressure containment system) and is generally manufactured from a welded flexible polyvinyl chloride with a clear rigid acrylic vision panel welded into helmet section. Half suits are attached to the containment system in a leak-proof manner and generally used for vertical access. The double layer allows the suit to be pressurised by HEPA filter air for breathing through an opening in the inner layer near the breathing zone. It also prevents the suit from clamping onto the operator and restricting movement. Suspension points allow for elasticised fastening that holds the suit at a suitable altitude and minimises suit weight burden beyond ergonomic limits. The attachment of the glove is similar to the glove-sleeve cuff arrangement. Remote handling systems consist of mechanical or servo links between the operator hands and arms and a mechanical manipulation system within the containment system designed for specific applications. 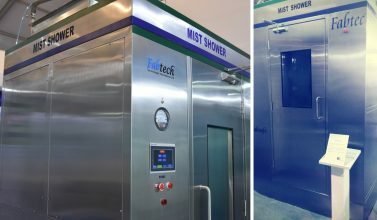 Fabtech offers solutions for all your containment solution needs – manufactured in-house at our at our state-of-the-art facilities. Fill out this form for more information.